Tonight I simply have a quick ‘n’ easy post to share a quick ‘n’ easy recipe with you. Stir-fry is the perfect solution for busy cooks – it comes together so quickly, and very few dishes are dirtied in the process! This one right here is a real crowd-pleaser, methinks. It’s also quite a healthy recipe. First, sauté seasoned chicken breast cutlets in a hot skillet with 1 teaspoon of sesame oil, flipping halfway, until cooked through. Set aside to rest. 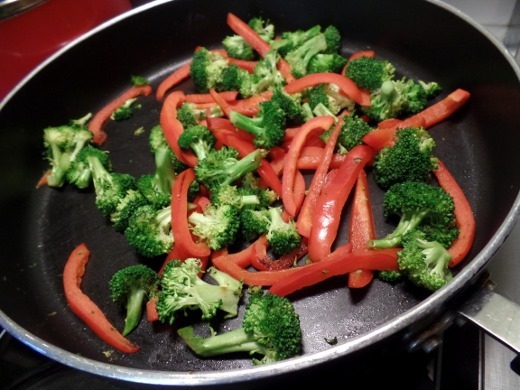 Next, to the same skillet, over high heat, stir fry sliced bell pepper and broccoli florets for about 4 minutes. The broccoli will turn bright green and the bell pepper will be crisp-tender. Once the chicken has rested for about 5 minutes, slice it into pieces. Add the chicken and the peanut sauce to the skillet with the bell pepper and broccoli, stir to combine, and cook for about half a minute. Serve over rice. We made coconut rice to make it a little extra special. The peanut sauce that coated the stir fry is absolutely delicious. 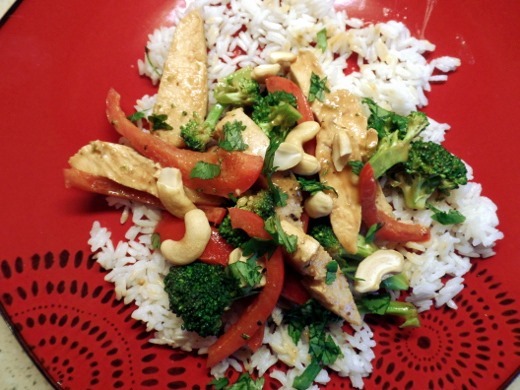 A sprinkling of cashews over the dish prior to serving adds another layer of texture and flavor. This is a solid stir-fry recipe for a busy weeknight! 1. Heat a wok or large skillet over high heat. 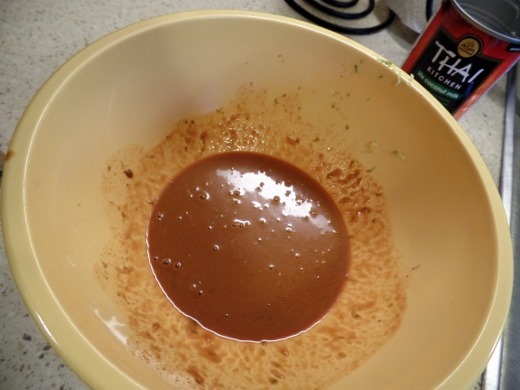 Add 1 teaspoon oil; swirl to coat. 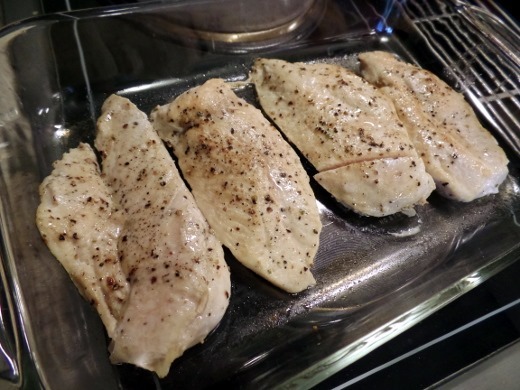 Add chicken; cook 1 minute on each side (or longer, depending on the chicken thickness [mine needed about 3-4 minutes per side.]) 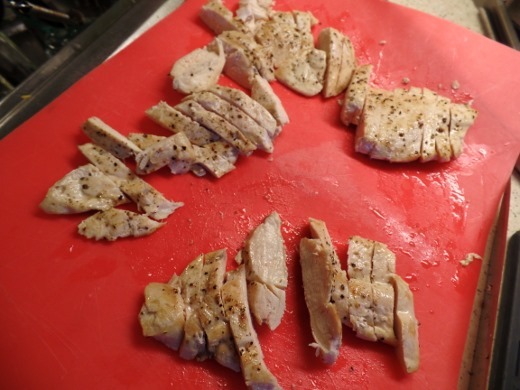 Remove chicken from pan; let rest, then cut into thin slices. 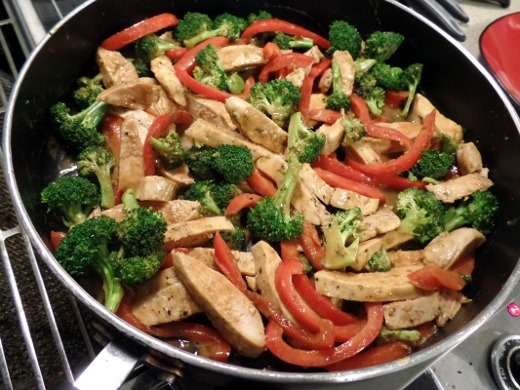 Add broccoli and bell pepper to pan; stir-fry 4 minutes or until vegetables are lightly browned. 2. Reduce heat to medium-high. Combine remaining 1 teaspoon oil, coconut milk, and next 7 ingredients (through cumin) in a small bowl, stirring with a whisk. Add chicken and coconut milk mixture to pan; cook 30 seconds. Sprinkle evenly with cashews. 3. Serve over rice, if desired. I wouldn’t change anything about the stir fry! 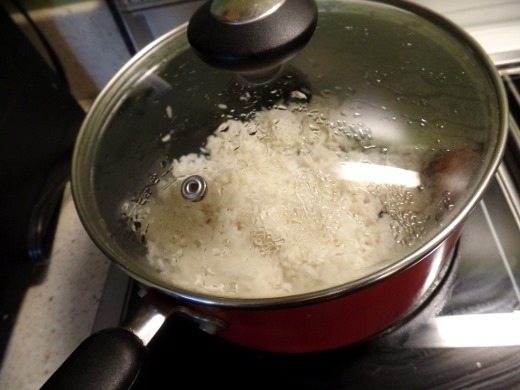 I might find a different coconut rice recipe, as the recipe I used wasn’t very coconut-y. I’d love to incorporate some toasted coconut into the rice.